Interoperability is the ability to exchange information between two systems and to use the information that has been exchanged. Visual Paradigm supports interoperability with BPMN 2.0 XML. 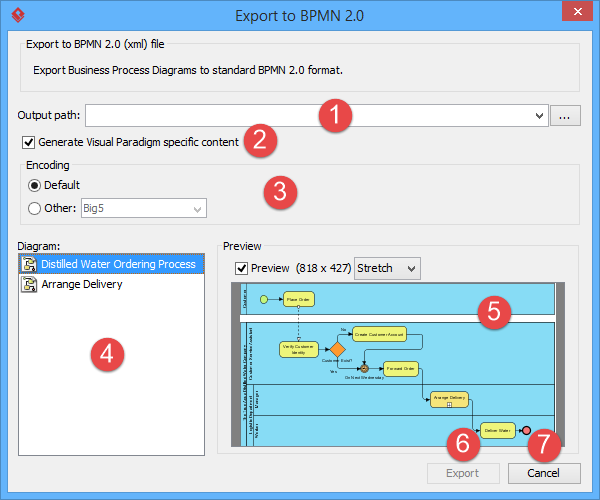 You can export project data, edit it externally with other softwares that accepts BPMN 2.0 XML. In this chapter, you will see how to export BPMN file. Select Project > Export > BPMN 2.0… from the toolbar. This displays the Export BPMN window. Specify the file path of the BPMN file. Click OK button to start exporting. Upon finishing, you can visit the output destination specified to obtain the BPMN. 1 File path The location where you want to save the file. 2 Generate Visual Paradigm specific content Project specific content refers to contents that do not belong to BPMN. For example, project management properties. 3 Encoding Encoding of the BPMN file. 4 Diagram A list of diagram of your project. Select the diagrams to export to BPMN. 5 Preview By checking the selected diagram and Show preview, it will be shown in preview window. 6 Export Click to export BPMN file. 7 Cancel Click to cancel exporting.